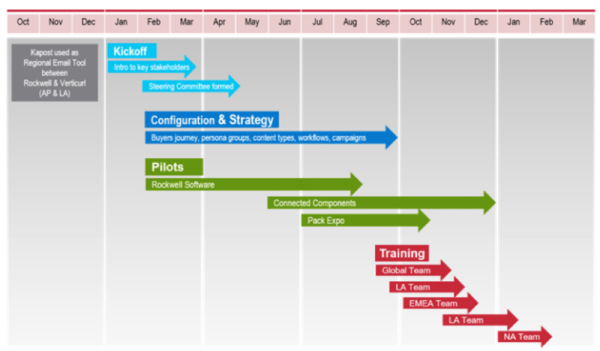 Over the course of 18 months, Rachel Schickowski and Stan Miller implemented a content marketing platform – a hub for all the marketing content of Rockwell Automation – for a team of 600 marketers around the world. Most of us wouldn’t have a clue how to accomplish such a feat. Luckily for us, Rachel and Stan shared their story at Content Marketing World, Implementing a CMS in Global B2B Organization. Rockwell Automation – a 100-year-old company with over 22,000 employees, the largest in the world dedicated to automation technology – generates a lot of marketing content. That content (white papers, videos, case studies, brochures, advertising, magazines, blog posts, and more) used to be scattered among servers and hard drives all over the world, and the content processes used to be disconnected and uncoordinated. Our customer magazine’s editorial calendar sat on an intranet site. Our blog calendar sat on a shared drive in our U.K. office. Our case-study program was being managed on a SharePoint site run by our agency. Content calendars were managed by various business units on various shared drives and desktops. When tools and processes are that fragmented, no one can get a strategic view of the enterprise marketing content, and the enterprise can’t fully realize the value of that content. Rachel and Stan wanted a tool to manage all the content and processes for all the marketing teams, from idea to creation to distribution to governance to analytics. They wanted to know what content their marketing teams were creating, how well it was working, and whether they had enough of the right thing. They needed a digital way to hold all that content and all that information about the content. They needed an enterprise content marketing platform. A content marketing platform is a hub for planning, producing, distributing, and analyzing content. It works with all content formats, including video, HTML, PDF, and zipped source files. Rachel, who has played various content-related roles at Rockwell Automation, oversaw the platform’s implementation, developing the infrastructure and leading the effort. Stan, editorial lead for the company’s Global Customer Communications group, provided the content and developed the processes. Here’s their approach to researching and implementing a new platform. Choose people who can poke holes and show what they would need in the tool, what gaps they see so that they can help you assess tools as you go through product demonstrations. Keep your company’s leadership apprised. You need their advocacy when you roll out the new platform. Find out what each team needs from a content management platform. “After you understand your requirements, you can be on a demo call for five minutes and know right away, ‘Nope, not the right one for us,’ and move on,” Rachel says. If you aren’t clear on your requirements, you can waste a lot of time in the vetting process. Determine how each platform would manage your campaigns, fit with your workflows (which vary from group to group), and integrate with your tech stack. How easy is it to use? “Find a platform that people will embrace,” Rachel says. You can’t bring your whole content repository into a new platform. Consider using the platform, at least at first, for new content only. If you bring in legacy content, focus on your best content. From the beginning – in tandem with your other activities – create pilot projects where the need is greatest in your organization. For example, Rockwell teams in Asia Pacific and Latin America managed emails in Eloqua and wanted help. 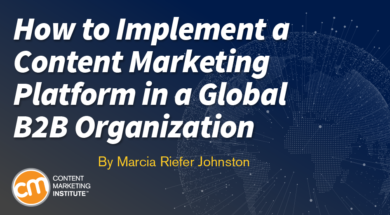 They created a pilot using the B2B content marketing platform Kapost, which supported them in dealing with translations, time zones, and their own vendors. Since Kapost integrates with Eloqua, they could connect the process of creating content and the process of building email assets. (In this case, Eloqua emails were the content, and Kapost was the platform that managed that content.) Content owners also had access to analytics. Stan suggests stress-testing a platform in multiple ways. His team followed on the heels of their colleagues in Latin America, doing a pilot project with the Rockwell Automation blog. “Integrating our processes and content development into the platform helped us refine our processes, find ways to save time, speed up reviews, and activate our content more quickly and efficiently,” he says. Stan also did a pilot with Rockwell Automation’s long-running case-study program, which followed strict processes for internal review, customer review, and legal review. Bringing those processes into the platform helped the team confront its overly long workflow and revealed places where the user interface needed new fields (for example, one to capture reviewers’ feedback). If you don’t have documented personas and buyer’s journey stages for your company, start there – possibly with the help of your steering committee. Consider your content types and taxonomy. If you’ll be integrating multiple repositories, you need to align your tagging and file naming, for example. Work with your vendor to adapt the user interface, adding custom fields as needed. Consider how existing technologies need to be integrated with your platform. As part of governance, create policy: Here’s how long content lives in the platform. Here’s the point at which we delete it. What rights does each person or role have? When do we add and delete people? Which partnering agencies get access? Finally, create policies for content development. Make it clear who submits ideas for a content type and who does not. 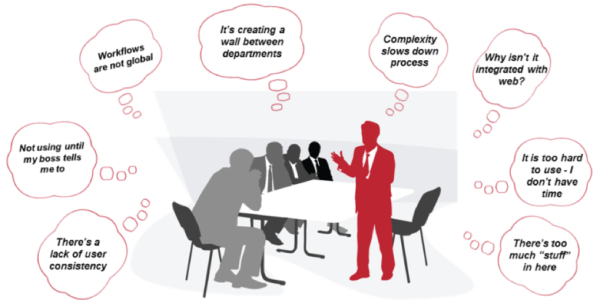 You don’t want to create an environment for collaboration and then invite chaos. Stan suggests setting up the platform so anyone who requests the creation of new content must include a strategy for the content, an audience for the content, a location for that content, and a call to action. Then, rather than seeing someone in an elevator and saying, “Hey, I want a brochure,” people must go into the platform and answer these questions before anyone creates that content. “Processes like that force us to be more strategic,” Stan says. Customize your training sessions according to the ways each group or role will use the platform. “Customization makes the information more ‘sticky’ and gets people into the tool faster,” Rachel says. Prepare training in a way that has people walking away excited about the things the platform enables them to do. To reinforce your training, find internal champions – super-users – throughout the organization who can help answer people’s questions. Consider setting up a series of lunch-and-learns, as Rachel did, inviting platform users to meet in person or call in, providing feedback on their experiences, and asking questions. When it was time to invite all marketers to use the new platform, Rachel and Stan had corporate leaders behind them, ready to explain why this platform was important to the business and that using it was not optional. Our directive came from the VP of marketing. Her team was accountable to foster the change management. If it had been left to my (content operations) manager and me to drive the change, we would have failed. Be realistic in the time you allow for this kind of project. Rachel credits the content-ops and demand-gen teams with doing great research. They had to understand the need and the integration expectations. They had to get buy-in from stakeholders in all the regions. “We had heard that the average company takes three to six months to choose, so our timing might seem sleepy. But rolling out a tool to 22,000 people is a lot to ask,” Rachel says. How about it? Have you seen your career take off after putting a platform in place? Or do you have stories with not-so-happy endings? Either way, please share your experience in a comment.